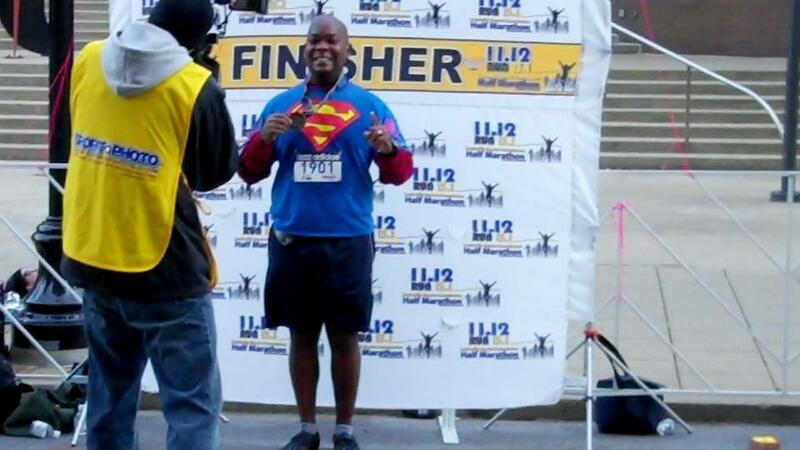 I parked near the finish line and walked to the starting line and as I was getting in line near the back of the pack, I heard "Hey Superman!" and a couple of different times I met some wonderful people who had read my postings on the Race's Facebook page. It was both and honor and a treat to meet them..and they were so incredibly kind. I also saw another good friend with her friends and we had a hearty discussion about bourbon (Hi Jen!!) While waiting, a couple of neat things happened: One they played "My Ol' Kentucky Home" while waiting at the start...which is ABSOLUTELY cool. And then to start the race, they didn't use a gun, but the call to arms from Churchill Downs. You wanted a homegrown running race from the Bluegrass State? You Got It!! I was off, now, I had just completed my first half marathon 14 days prior, and worked all night. The name of the game was Running Smart. Having enough/anything in the tank to kick at the end. So I wanted to aim for a 12:28 minute/mile pace for the first 4 miles. Well, that didn't happen, but by Mile 2, I was able to stay slow at 12 minutes/mile and stayed there. As I approached Mile 4 and 5, we passed Cave Hill Cemetery...and this is the 3rd race I have had that has run around here. I got choked up and a few tears fell from my eyes. My Dad, who passed on my 22nd birthday is buried here. I always feel heavy of heart when I run pass him. I wonder if he is proud of the man I am working so hard to become. I wonder what he thinks of his grandchildren, or what he thinks of me as a parent. I am good about keeping these thoughts below the surface, but whenever I am near him, they come to the surface. As we passed Cave Hill Cemetery, I said Thank You to him. Now as we were getting to Mile 6, we were now at Cherokee Park...or as I would like to call it, H.E.L.L. Seriously, Google Cherokee Park in Louisville, KY and read about the hills...and what felt so familiar to me, since this was the place of my first race..a 5K in April of 2010...I decided to do this, with no training, and walked most of it, and it has bothered me in the year and a half I have been a Runner. Well, I left my receipt on Cherokee...I NEVER walked any of the hills and kept grinding...each mile marker in Cherokee, I wiped sweat off my brow and threw it to the ground, as to say, "You want to go ONE ON ONE with ME??? You WILL NOT claim me...You might be hills of earth and concrete, but I'm. The. Man. Of. Steel!" As I left Cherokee, I had won that round, I knew it took a lot of out me and all of the runners at this point, but I was still moving and still running along...Another wonderful thing was, along the route, people would randomly tell me how they loved my shirt (the girls handprints and footprints) or as I passed the wonderful spectators who shouted, "Go Superman!" This warmed my heart and I made sure to say Thank You to each and everyone of them. Along the route, I would also come in contact with people I knew and it was always nice to see them and hear their encouraging words (Hi Rebecca Jo, Rob, Lisa, etc!!). To a longtime Daily Mile friend, Erin, she helped me so much. She ran me in the later miles when I wasn't sure I had anything left in the tank. I am so grateful for this encounter. We talked about racing and our spouses and the Coast-to-Coast medals you get from Disney (yes Erin, I am now REALLY considering it), and because she wasn't feeling too good, she stopped to walk and told me to keep going and yelled encouragement, and that was SO kind. This is yet another reason I LOVE the Running Community! With about 8/10 of a mile left, I heard music from one of the many music stops along the way. 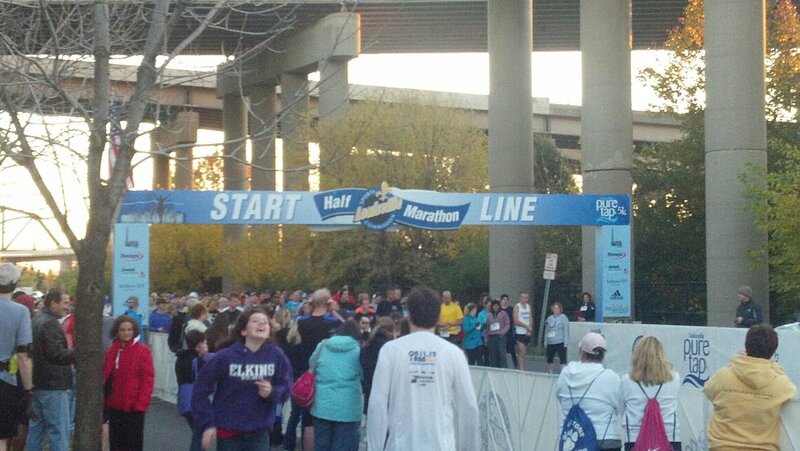 It was a DJ shouting encouragement to runners, willing them to the finish line. He saw me, and shouted, "Hey Superman...I'm gonna play this for you!" And then he put on the theme from the Superman Movies!! I was pumped...I was also excited because I was getting close to seeing Damary and the girls again...and I am nothing without their love and support. I got closer and closer and FINALLY I crossed the line...What started as a crazy idea when I saw the advertisements at the Derby Marathon Expo ("Hey, why not do our first Half Marathon 2 weeks apart at 2 brand new races!") this past April...a day before I would run my first Marathon; had concluded. A wonderful addition to this was one of my dearest friends volunteered for this race and she was handing out the medals, so I made sure to go to her and got my medal and got a hug. I told her Thank You, and then focused on Damary and got my hug and kiss from her and the girls. Flat out, I HURT...When I was walking to get my Mylar blanket, and to the Finisher photo, I felt what is best described as an electric shock, up my shin. It is gone now, but I have NEVER felt that after a race. We got something to eat and rested. The girls told me how proud of me they were and I was so thankful for them. This race took a lot out of me, and I haven't fully recovered yet...In all of the races I have done, this recovery week off from running will be welcomed. These two Half Marathons took something out of me. now get some rest,and enjoy some r&r time with your girls!!! There is no doubt that your Father is proud of you Corey. You are a shining example of a dedicated husband & father.